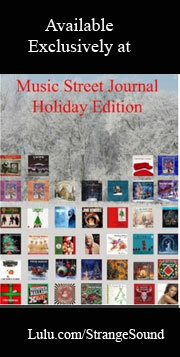 It is safe to say that if you are an avid reader of Music Street Journal, then you are not only a fan of recorded song, but of live performance as well. Whether it is an arena filling spectacle by U2 or a lone singer and their guitar playing a coffee shop for the love of the craft, and all the other levels of performance in between, you have undoubtedly attended your share of concerts. Indeed, live music is an indelibly important form of artistic expression and appreciation for humankind. It is music and its inherent magic which is the message behind Dial: an Operock. 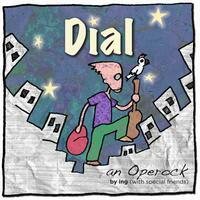 The artist behind Dial: an Operock, is the San Francisco, California-based band and music collective known as “ing”. Comprised of multi-instrumentalist and vocalist Mark Smotroff, bassist John Ashfield, singer Sean Mylett (on tracks 1,4,7, 15) and piano from Mitchell Stein. Another very important aspect of the creativity that went into Dial: an Operock, is the wonderful illustrations accompanying the album, its website and the DVD which comes with the physical release, all created by the hand of John Schnall. For more about the band and its history, be sure to check out the website for Dial: an Operock or even better, take in the elegant liner notes for the album by Michael Layne Heath. What is the story behind Dial: an Operock? (Bonus points to ing for the clever turn of phrase with “operock”). From the album’s website, “Dial is a cautionary tale about music and discovery. A musical journey regarding one man’s exploration of the universe around him and his greater purpose in life, making music.” Dial’s journey of awakening features a pair of protagonists, Bobby and a bird named “Dial,” and is set in what is perceived to be a sunless Ridley Scott-vision of a city, filled with adults who are living zombies; somnambulists going through the motions of life, grown desensitized to the plague of negativity in their lives. Wall before you forever associated the visuals of their accompanying films with the music’s story. And yet, Dial: an Operock definitely feels as if there is some sort of expanded visual treatment waiting to be created, whether filmed, animated or staged, that could bring the story full circle. One of Dial’s greatest strengths lies in its originality. Despite it being easy to compare the relative similarities of concept pieces, Dial: an Operock truly plays like no other current music, both in style and delivery. And it is this, just like a core piece of its sound, where Dial: An Operock proves there is real creative magic in the world, if only you know where to look and listen. Look and listen here. You ears and your soul will thank you. If you are going to invest your time in listening to a concept album, it better lead off strong, and Dial: an Operock does not disappoint. The beats and bass that begin this tale grab you quickly and don’t let go as the vocals join in. Like many of the songs on the album it sounds like nothing you are already familiar with, just one of the many joys to be found while listening to it. Let the alt pop-infused music and lines like “Wade the water, summertime/Paraphrasing Joycean rhyme” wash over you and join the protagonist on his musical journey. This is among my favorite tracks on the album. We are introduced to Bobby, a 27-year old who’s just “awoken.” He is one of the few adults in a city resembling a post-nuclear-like landscape that is awake. Appropriately dreamy in tone, this almost sounds like it could have been composed on sitar and then re-composed for western instruments. A pure piece of furthering the story, the vocals on this one are just slightly reminiscent of Roger Waters, with their emotive, near voice-cracking, narrative mode. The guitar line at the latter half of the song foreshadows the reveal of the album’s sonic spine. A Western flavored bass line and a guitar tone which escaped from the House of the Rising Sun sets this song in motion. Bobby has begun his journey, though he’s not sure where he’s going. This is a feast for connoisseurs of allegorical lyrics (my personal favorite being: “instead I’m a half-life angel not getting very far”). Kudos to guitarist and Dial mastermind Mark Smotroff for the burning guitar solo. Hand’s down this is one of the strongest pieces on the album. Keep reading to understand why this song could very easily exist as a hit in and of itself. Pay close attention, as this is the all-important aural through line of the album. It is simple yet complex and instantly infectious to your ears. The use of children choir voices punctuates both the innocence and the power of these notes. It is a wonder to this reviewer that no one previously arranged something utilizing this set of mellifluous musical tones. In that way and more, it is very much a magic melody. It is at this point in the story that we and protagonist Bobby are introduced to Dial, a bird with a sun dial crest who entertains the non-sleepwalking children in the oasis among the depressing city-scape. A melodic, repeating synth line echoes throughout the piece, keeping the vocals aloft. All the best concept albums have stand out tracks. Dial: an Operock is no exception. If in our world (or perhaps in an unperceived other reality) there were less somnambulists running things then tracks like “Astrophobia” and the previously discussed “Long Walk Home” would enjoy single status and exist as life forms unto themselves. Hearing them on something called “a radio” may even intrigue the listeners’ ear to the point where they exclaim: “Hey, there’s more to this sound. I sense something bigger amongst these words and chords and I need to know more.” This six minute, guitar-driven number features vocalist Sean Mylett and revisits “Dial’s Theme,” the first of many instances of this throughout the album. While Pete Townshend ostensibly coined the use of “Underture” on a concept album, and everyone from The Who to countless decomposing composers have included overtures in their works, ing moves this traditionally instrumental, theme-encompassing piece to the Middleture of the album. “Dial’s Theme” is represented ever so beautifully via a range of instruments from keys to guitar to light orchestra-esque strings. Upon hearing it, you will be hooked to continue on with your listen, if you weren’t already. Not only is this string and piano-based piece a delightful listen, its vocals will quite literally give you the boost the title represents. I can highly recommend that you add it to a wake up or morning constitutional playlist featuring The Call’s “Let the Day Begin” and OK Go’s “This Too Shall Pass” as a great way to, ahem, kick start your day. 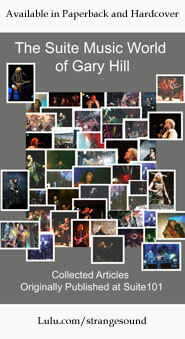 Efforts are underway to turn Dial: an Operock into a full-fledged musical production. Should that wonderful development come to fruition, this will be one of the songs more than a few theater-goers will be singing joyfully on their way out of a performance. Featuring “Dial’s Theme” at its core, this is the most obviously musical in nature piece on the album. We are introduced to the character Old Norman, as sung by Rick Cantor. His Borscht Belt delivery playing off of Mark Smotroff’s Bobby is so well done that you can almost see how the scene would play out in a live setting. “Men in the Mirror” is dreamy and ethereal in tone, like a visit to a land where tomorrow never knows. With a trio of intertwined vocalists (Smotroff, Mylett and Rick Cantor portray the Men in the Mirror characters) and literally dripping with Lyrsergic trippiness, it segues nicely and directly into the next piece. Here we have an instrumental where “Dial’s Theme” is revisited. Slightly jazzy at its base, it features excellent counterbalance from the string section and crossfades directly into the following song. Incorporating the aural through line in splendid fashion, one almost feels like these crossroads could lead to Tommy’s “Holiday Camp” if you went down the right path. In proper fashion for a rock opera, err, operock, these latter pieces continue to flow into and out of and back into each other. That is as clever a titular conceit as you could expect from a concept piece such as this. Another example of a song from Dial which stands brilliant of its own accord, this features a terrific rhythm section, appropriate use of guitar and a unique set of synth voices. Fast paced electronic beats propel this crescendo of a number where the zombie-like adults of the city demand more from Bobby and his secrets of music. Without spoiling the end of the story (I implore you to seek it out at the musical’s website and on the album) this is as perfect an ending movement to a work such as this as a listener could hope for. We’re now outside the wall, as it were, and have reached Dial’s denouement. Don’t let life pass you by. Embrace it to the fullest and don’t abandon that which makes you happy. They end on a cherry note with a message that more than a majority of people in this world as it exists in ‘11 should strive to live by. Should Dial: an Operock find itself trodding the boards in proper fashion, this will song have audiences dancing up the aisles and into the night, exactly like a good musical should.